The sane section of every society recognises that juiciest aspect of leadership lies in the ability of the leader to influence, discharge and deliver good leadership as well no leader can deliver good leadership with outstanding efficacy without experience that has no alternative. If experience is the only yardstick by which Umar Ajiya, MD PPMC will be measured, he will not be found wanting in every front he has represented his agency. Umar Ajiya has acquired experience throughout his life at the NNPC which has made him an astute administrator and this he has brought to bear as MD PPMC. 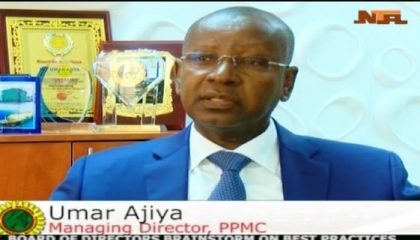 Shortly after resuming as PPMC MD Umar Ajiya pledged to move the company in the direction of growth and profitability and today he has positioned the agency as one of the leading company among others. During his interaction with Board of Directors, the MD Said, “We will strengthen our efforts to further grow the business and increase profitability as envisioned by the founders of the company” He has demonstrated in every capacity that he is equal to the task of discharging his responsibility. It is no longer News that we are going to celebrate 2018 yuletide hitch free without any cause to worry for fuel scarcity, indeed Umar Ajiya as the MD for PPMC has been working round the clock to ensure Nigerians enjoy the festive period free of any kind of Fuel scarcity. In His words, he said Nigerians should go their normal businesses as adequate arrangements have been put in place by the NNPC and PPMC to ensure that there is continuous supply and uninterrupted distribution of petroleum products throughout the country. In the same vein, he directed that all NNPC retail stations would be operational across the country throughout the festive season in order to ensure seamless supply and distribution of petroleum products. Umar Ajiya has returned PPMC to profit making venture as one of the Nigerian National Petroleum Corporation Products Marketing Company limited (PPMC) this has made the company recorded N32bn profit between January to September 2018. Umar Ajiya has demonstrated administrative Skills in discharging his responsibilities.